If you have a parakeet, they probably sleep when you sleep. Most parakeets end up falling asleep and waking up at the same times as their owners. Some also sneak in a few small naps throughout the day. But parakeets' quality of sleep can vary depending on the comfort of their sleeping quarters. 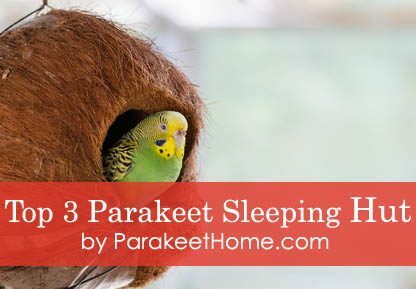 Keep reading to learn more about parakeet bird sleeping solutions, including the top three sleeping options for your parakeet. Parakeets are a lot like small children when it comes to bedtime. There's a lot that must be done -- and not done -- to keep them happy, healthy and sleeping peacefully. Here are a few quick tips to remember when you put your precious parakeet to sleeping hut. Parakeets don't like to sleep in complete darkness, so it's important to keep a small night light on. Plus, never put a blanket over the cage, as this simply scares parakeets. Parakeets get very scared when there are sudden, loud noises. Keep it quiet!When parakeets sleep, less is more! Keep their cages simple and uncluttered. What is Parakeet Bird Sleeping Bed or Hut? This might surprise you, but parakeets actually love snuggling up for bedtime. Many like to lay down flat on a soft surface as they wind down for a good night's rest! In addition, most parakeets can really benefit from sleeping in a bed. No, not your bed! Parakeets actually love lounging in their own bed or sleeping hut in their own cage. Parakeet beds can alleviate a bird's stress and provide them with a comforting sense of security. There are a big variety of parakeet beds out there today. Some are bigger than others, some allow birds to sprawl out and others keep birds more confirmed. With that in mind, read on to learn about the top three sleeping solutions for parakeets! This beautifully unique perch tent for birds is the perfect size and shape for parakeets to sleep in at night or for naps. Your bird will love snuggling into this soft fleece tent. The open bottom even allows your bird's droppings to quickly fall to the bottom of the cage at any time. Plus, this tent includes a built-in perch, perfect for sitting, as well as a string of plastic beads and a bell that'll give your bird hours of play time. This sleeping bed doesn't allow any accumulation of droppings and there's no risk of your bird getting stuck. Parakeet Bird will adjust very quickly to this cozy tent and that they look forward to sleeping comfortably in it every night. This small parakeet bed can be a perfect sleeping tent for your parakeet! The small size helps birds feel comfortable and safe, and the dense fleece fabric helps keep them warm all year around. Simply hang this hideaway from the top or side of the bird cage with the included clip, and then watch your bird snuggle up into this cozy pouch for the night. Plus, its durable plastic base offers the perfect support for your parakeet to feel completely secure. Birds enjoy them so much that they'll not only go in for bedtime, but they'll also spend many hours a day hanging out in their cozy hideaway. It’s a great way for your parakeet to feel warm, secure, safe and loved! This cute hammock for birds will make your parakeet feel safe, warm and cozy! It features super-soft fabric and a confined space to help your parakeet feel wrapped in a cocoon of warmth and love as he settles in for night-time or nap-time. Plus, it's super easy to hang in your parakeet's cage with the included bilateral hooks. Your bird will love snuggling into this soft fabric and be dozing off comfortably for the night! Ready to Buy a Bed for Your Parakeet? If your parakeet needs a safe, comfortable place to sleep, any of the three options above are solid choices. All three products offer a safe haven for your precious parakeet, which leaves him sleeping peacefully through the night -- and leaves you enjoying every moment of being a bird parent! Copyright © 2018 Parakeet Home. All Rights Reserved. Parakeethome.com is a participant in the Amazon Services LLC Associates Program, an affiliate advertising program designed to provide a means for sites to earn advertising fees by advertising and linking to Amazon.com.